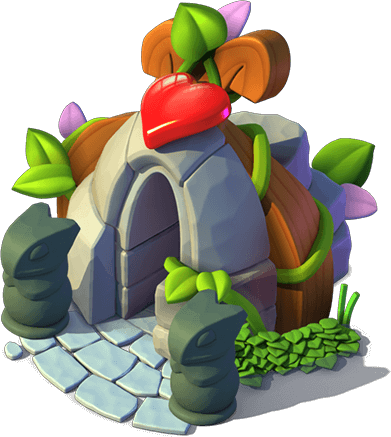 The Breeding Den is the only place where Dragons can breed in order to obtain other Dragons. Dragons that are in the Breeding Den will not produce Gold, perform any actions, or be interacted with in any way whatsoever. They also will not be able to return to their Habitats until breeding is finished (which is indicated by the icon atop the Breeding Den) and the resulting egg has been moved to the Hatchery. 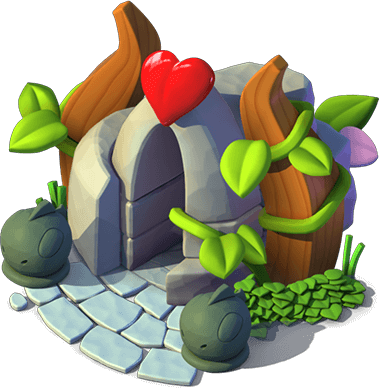 If the Breeding Den is selected while having this icon above it, the egg will be automatically moved to the Hatchery if there are free nests. If there are no free nests, a window will appear informing the Trainer they have to free some nests before placing the egg. Once the Trainer has provided enough space for the egg, the Breeding Den can be selected and the now-available button can be pressed to send the egg to the Hatchery. Whenever a Dragon is unavailable for breeding, its snapshot in the Den will be grayed out and the reason will be given in the corner of its snapshot. Selecting the Den will bring up three breeding options. The first option takes the Trainer to a screen which shows two lists, side by side, of all of the Trainer's Dragons which are eligible for breeding, and a Dragon is selected from each list. The Dragons can be filtered either by Element using the button or by name using the button. The second option will reuse the last breeding combination the Trainer used, but the Trainer will still need to confirm the breeding choice. Should the Trainer desire to change a parent, pressing the button under the chosen Dragon will access the list of Dragons. The third option gives direct access to the Enchanted Breeding menu. The last option can be accessed even if a breeding is currently ongoing. Once the Dragons the Trainer desires to breed together are selected and the button is pressed, the Dragons will breed for a period of time to produce one egg. If the Trainer has an active VIP Status of Level 2 or higher, the icon will be shown on the button. 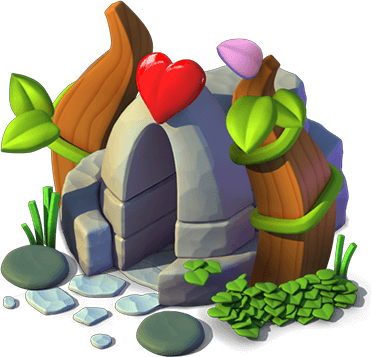 In addition to those two breeding options, selecting the Breeding Den will also bring up the option and pressing it will display information about the basics of breeding or Enchanted Breeding. After a breeding has started, the time remaining until it is finished will be shown across the Breeding Den. The Breeding Den displays only the two highest units of time, thus the actual time might slightly differ from the displayed time. 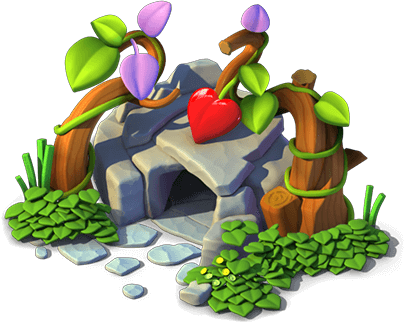 Selecting the Breeding Den during the breeding time will bring up the option which displays the amount of Gems needed to skip the remaining breeding time. Selecting the option will bring up a window where the Trainer can see the two breeding Dragons, the time left until the breeding is finished, and the button. Pressing this button will speed-up the remaining time, allowing the breeding to be finished. Occasionally, the icon will appear and, upon selecting the Breeding Den, the Trainer will be given the option to watch a video by pressing which will skip 30 minutes of the breeding time, in addition to the regular way of speeding it up with Gems. This action can be performed twice for a total skipped time of 1 hour each time it is available within a period of 24 hours. If the time left for the current breeding is fewer than 30 minutes, then the button will be shown instead. After initiating a breed, if the Trainer still has the option to watch a video to skip breeding time, the Breeding Den will present the Trainer with a button underneath it. Selecting this button brings up a window providing the Trainer with the options to either skip the breeding process with Gems, or to watch a video to reduce it. Should the Trainer not choose to use this function immediately, interacting with the Den afterward will bring up the aforementioned window by default. As long as videos are available while a breeding is ongoing, the aforementioned window will be always brought up, thus the and will not show up when selecting the Breeding Den. Before commencing a breeding, the option can be selected in order to bring up a window with all the possible outcomes that can result from the currently-selected combination of Dragons. The window will display the eggs of the outcomes along with their Elements underneath them. Selecting any egg will show the name of the Dragon. If a Dragon is already owned by the Trainer, this will be visibly indicated. If a Trainer already has all of the possible outcomes of the selected combination, an informative window will pop up, given the Trainer the option to either use the same combination or change to another pair of Dragons. Inside the Breeding Den, at the top of the screen, the button can be selected in order to receive recommendations on which Dragons to breed next. A maximum of three Dragons are randomly chosen from the Normally-Breedable Dragons the Trainer does not have on their islands, with the notable exception of Breedable Legendaries, while the other Dragons are chosen from those that are available for breeding through a Breeding Token. If there is no Dragon left to be bred, then the Breeding Helper will recommend breeding a Limited-Time Dragon. The Dragons that are shown in this screen have the same snapshot that they have inside the Main Shop. Pressing the will bring up the Codex Entry of that Dragon while pressing the button will automatically select two possible parents that can be used to breed for the recommended Dragon. 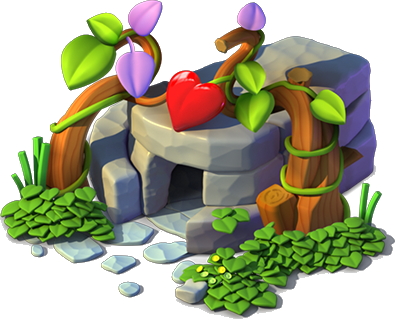 The Breeding Den can be upgraded to various levels in order for specific Dragons to be bred so as to obtain Enchantment Dragons. 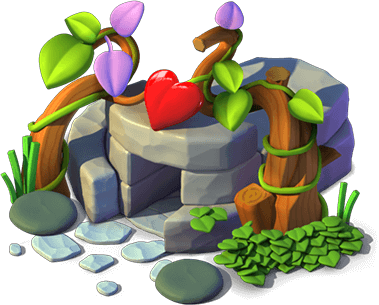 The Den can only be upgraded in exchange for Enchanted Trinkets and each new level of the Breeding Den that is unlocked opens up certain Enchantment Dragons. The Breeding Den always takes 6x6 squares in size, regardless of its level. 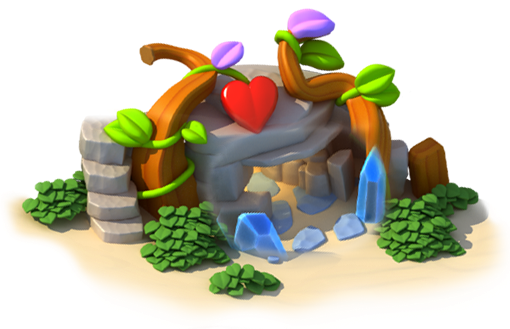 Once the Den is upgraded for the very first time, the option will be made available on the right-hand side of the screen after opening the Breeding Den. Accessing this screen will bring up a selection of all the Enchantment Dragons currently available in the game. Each Dragon has their rarity displayed in the top-right corner of their snapshot and the button in the opposite corner. Pressing it will bring up the Codex Entry of that Dragon. Dragons that have not yet been unlocked will have their snapshot grayed out along with information about the level the Breeding Den needs to be upgraded to. Selecting any Enchantment Dragon that is available for breeding will display the specific combination of Dragons it requires. 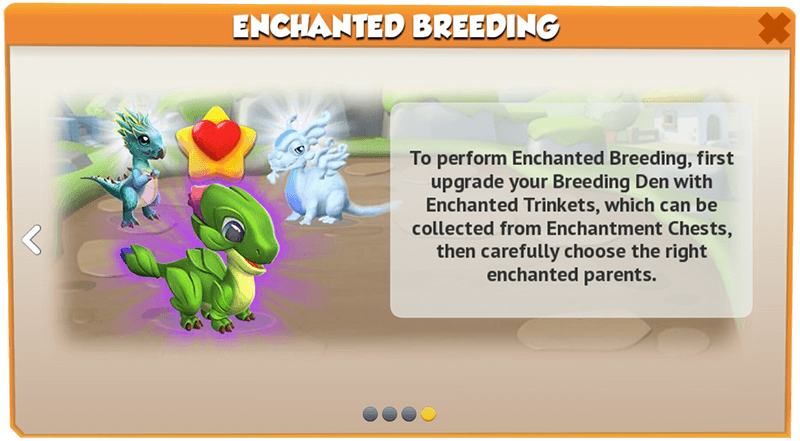 If both Dragons are free and meet the necessary Enchantment Level, the option can be pressed to commence breeding them together. If a Dragon is unavailable for breeding, its snapshot will be grayed out and the reason will be listed next to it. If a Dragon does not meet the required Enchantment Level, the necessary level will be displayed next to its snapshot, and in addition to it being grayed out, the snapshot will have the button on it. Pressing that button will take the Trainer to the enchanting screen where the Dragon will automatically be selected. If the Trainer does not have one of the necessary Dragons, its snapshot will be grayed out and the button will appear on it. Upon pressing it, the Trainer will be taken back to the main screen of the Breeding Den. If the Den does not have the necessary level allowing a certain Dragon to be bred, then the button will be shown and pressing it will take the Trainer to the screen for upgrading the Breeding Den. The Trainer has the option of hiring an additional Breeding Den for a period of 30 days. The cost of hiring this Den is 4.99 USD and can be done by selecting the Breeding Den itself or by going to the limited-time breeding screen, through the button in the lower right-hand corner of the main screen, immediately above the access to the Main Shop . The exact same Dragon can not breed in both of the Breeding Dens at the same time. This Extra Den is located to the left of the Clam. As is it part of the Main Island, it can not be moved. Furthermore, it can not be upgraded, the Trainer being able to breed only the Enchantment Dragons that can also be bred in the usual Breeding Den, meaning that this Den is directly dependent upon the level of the regular one. The same breeding mechanics and buttons are available with the Extra Den that are available with the usual Breeding Den. Additionally, selecting the Extra Den will display, underneath it, the total amount of time left until the ownership expires. If a breeding is ongoing while the availability of the Extra Den has expired, ownership of the Den will remain valid until the breeding is finished and the resulting egg has been moved to the Hatchery, meaning renewal is not necessary to allow said breeding to continue. Update 4.3 changed the background inside the Breeding Den. The Breeding Helper was moved from the limited-time breeding screen to the inside of the Breeding Den. The button was replaced with the button. The Breeding Den will now show all the possible outcomes of any combination of Dragons. The Trainer will now be informed if the currently-selected pair of Dragons has already produced all possible offspring. The graphical interface of the list of Dragons has been altered. When selecting the rebreeding option, accessing the list of Dragons must first be done through the newly introduced button. Before this update, the list of Dragons was automatically displayed. Update 3.8 introduced the Extra Den. Update 3.7 has once again reintroduced the option to reduce the breeding time through watching videos, along with the new icon. Update 3.6 has once again discontinued the option. Update 3.5 reintroduced the option. Update 3.1 made it possible to access the Enchanted Breeding menu while the Den is busy. Additionally, the option was discontinued. Update 3.0 replaced the information windows, that appear when pressing the button, with new ones and added two additional ones. It also introduced the option to partially skip breeding times by watching videos whenever the or buttons are available. Update 2.9 changed the icon on buttons and wherever else it appears with the icon. Additionally, it added the button to the Breeding Den. Update 2.5 introduced an additional information window when pressing the button. Update 2.3 introduced upgrades for the Breeding Den as part of the Enchantment feature. Update 2.1 introduced the option to search Dragons by their name . Update 1.4 introduced the re-breed button and replaced the button with the button. Update 1.1 added the information window for the basics of breeding to the Breeding Den through the newly-introduced button. This page was last edited on 30 March 2019, at 11:05.